By Hanmero in New Arrival on 2017-06-22 . 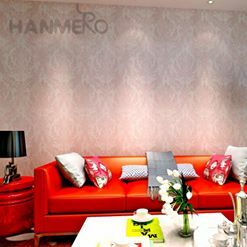 HANMERO model QZ0155.Applying advanced flocking technology, this European style wallpaper gives you a flexible and soft touch. Embossed surface treatment offers you a comfortable visual experience. Live healthy life with this European style wallpaper wallpaper. Made of pure natural fibrous materials, this non-woven wallpaper is characterized by environmental-friendly and high air permeability.This European style wallpaper is tear-resistant when wet, so this wallpaper is very simple to handle. When you want to change it for another wallpaper, you can simple stripe it off in a full sheet. Since this material of wallpaper is waterproof, you do not have to worry if it would get moldy during humid weather. When there is stain on the wallpaper surface, you can simple wipe it off with a wet mop.If you want to change it, you do not have to use professional tools or chemicals. You can leave them dry and strip it off. There will be no wall damages during the removal process. Why You Need To Pay Attention To Wallpaper Repeat? How to Hang New Wallpaper Over Old Wallpaper? HANMERO: The trouble cheap inferior wall paper hidden should be so big?